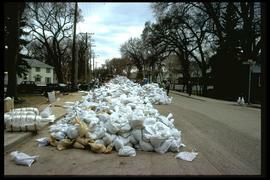 A photograph of a line of sandbags down Scotia Street during the 1997 flood. A photograph of a satellite dish in the floodwater on the other side of a sandbag dike on Scotia Street during the 1997 flood. A photograph of a street address spraypainted on a sandbag dike on Scotia Street during the 1997 flood. A photograph of the flooded soccer field at St. John's-Ravenscourt school during the 1997 flood. A photograph of a man throwing sandbags into a pickup truck bound for Grande Pointe during the 1997 flood. A photograph of an excavator at City Yard loading sandbags into a dump truck bound for Grande Pointe during the 1997 flood. A photograph of a loader preparing to lift a large sandbag.